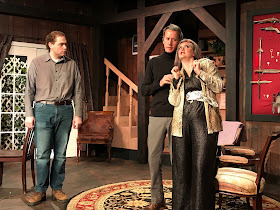 Actors setting the scene in a local production of "Deathtrap." They say everything happens for a reason. I’m starting to think I was meant to work for a theatre company so I could be exposed to a different type of writing. And while I haven’t attempted to write any plays yet, I’ve discovered ways I can take what I see in scripts and performed on the stage and translate them to my own creative pursuits. When you watch a musical, it’s obvious that the characters are kept busy. Most of them are part of company or individual dance numbers, or ready to break out into song at any minute, complete with hand gestures. With straight plays, the characters can’t just stand (or sit) around talking because there’s not much for the audience to engage in visually. When our company produced the beloved play “Steel Magnolias” this past summer, I made an effort to watch what the characters who weren’t speaking were doing. While Shelby and Truvy were chatting it up in one corner of the “salon,” Clairee was rifling through a recipe box on a sofa. Annelle was across the “salon” shampooing and setting M’Lynn’s hair. Ouiser was swaggering around the stage, scowling at everyone. These were subtle actions, but they all blended to make one cohesive scene. In our most recent production, the murder mystery “Deathtrap,” characters often strolled across the stage to pour themselves “brandy,” and the wife, Myra, fidgeted in the corner, working on a needlepoint, trying to ignore the fact that her husband the playwright was cooking up a murderous plot twist. The psychic in the production, Helga Ten Dorp, would not have provided the comic relief she did if she had not sauntered all across the stage touching the weapons that hung on the walls and pressing her palms to her forehead dramatically. I started looking at the way my own characters were behaving in my creative writing. In my short story about a summer camp murder, I tried to build tension when introducing the children at the beginning of the story. Nine-year-old Tammy Morgan bent over her notepad, pencil scratching across the lined paper, occasionally stopping to tug at the ends of her shiny blonde pigtails and chewing on the end of her eraser. In “Amelia,” I worked on a description of a female cult leader hospitalized for dementia, trying to show the reader how much her appearance still meant to her. Amelia stared for a long moment at the closed door, and then removed the glasses from her face. With gnarled fingers covered in sparkling rings she slowly picked up the ornate-handled mirror from the table that sat beside her, using two fingers to pull back the already-tightened skin around her eyes. She pursed her plumped lips in the mirror, and then set it back down. I’m now looking at my work with a more critical eye. So the characters are sitting around and talking. What else can they be doing? How can they convey that they are nervous, worried, or angry without actually saying the words? How can these actions help carry the story along? What are some ways you’ve used actions to help describe a character’s demeanor? Is it something you notice when you’re reading a book by a favorite author or is it done so seamlessly you don’t notice it? I’d love to hear your thoughts! Renee--I've been relying on "The Emotion Thesaurus" to help me with gestures and facial expressions. The bigger movements... the background action... I'm still working on making sure that's filled in, instead of just ramming through with dialogue and narration. I know several people who love podcasts. I guess I should give them a try? Beats of action are so important to help keep our readers engaged. That said, I find myself having to go back and add them in after I write the dialogue in some sections. In a recent class, one of my assignments was to write an essay entirely in dialogue only, and man, was it hard! And boring to read. It was a great tool to stretch my dialogue skills, but it ended up talking heads. It's so important to break up dialogue with action, dialogue tags, inner thoughts, and description. I like to add both types of actions--ones that are seamless to read and move the dialogue along, and descriptions or actions that are so unique they stand out, to slow the dialogue down and take a breath. I think both are important. I like your examples, Renee! Thanks for sharing those. I haven't read "Amelia," but I can really picture her with the sparkly rings and plumped up face. It sounds super interesting! Sioux--You have got to check out some podcasts! You will get hooked quickly. There's a podcast for just about every subject. There are even several on historical fiction books I'm sure you would love. "The Emotion Thesaurus" sounds like something I need--is it a book I can order? Sue--I've been filling in action during the revision process, too. I've even gone back to some of my old short story drafts and picked out places where I can add in those little snippets. It's like a game now to mix it up! Angela--I'll bet that was hard, writing an essay only in dialogue. I can't even wrap my brain around that! The best part about "Amelia" is what the character says after she sets the mirror down. She's got a great last zinger of a sentence in the story. Wink Wink! Margo--I seem to find my characters frowning or glaring a lot. I have to make a conscious effort to make sure they do things like check their phones, cross their arms, facepalm, etc.